Spoil your family - stay at the best on the West Coast Beach. Capture the sunsets from the balcony of our elegant, Non-Smoking, 1900 SQ.FT. corner condo at the premier Beach Palms. Beach Palms property is well maintained for your pleasure with security on site. Our condo has an underground private parking space.We also have a surprise closet filled with beach toys,floats,ice chest and beach chairs for your use. HANDICAPPED EQUIPPED!! 4 TVs, Smoking on balcony only, please Departure Clean $130.00 13% Florida Tourist Tax is added to all rental fees. Very clean when we checked in. Great access to the beach. Kitchen was well stocked with utensils if you wanted to cook. Would definitely stay at this condo again. Great location, steps from sand, nice condo. We had a great time! Thank you Juan, for your kind words, know that we appreciate the time you spent giving us the review. We are always happy to have guests reviews read by future guests as we know this is what may have them decide to try our unit for their vacation. Me and my family recently stayed in this beautiful place. It has 3 bedrooms and everything you need for your vacation. We stayed there for a week and location is great, everything is so close. The beach is very clean, safe to swim with little kids, not crowded. The pool is nice as well. Definitely will recommend this place for anyone! We cooked our meals ourselves and saved a lot of money! The kitchen has everything you need for cooking and baking. There is Wal Mart about 5 miles away. One of the best things I like about the condo is spacious balcony with brethtaking views. The owner is very helpful and will respond to you the same day ! 100% recommend! I appreciated mostly dealing with the owner, Violet. She was great fun and very trustworthy. The access to beach was wonderful as I am having some trouble walking long distances. It was quiet with no neighbor noises. The parking underneath and out of sun was very much appreciated. We had lovely weather. The beds were comfortable and it would have been nice to have at least one high rise toilet. We vacationed with my son, his wife and twin 3 yr olds. I was concerned about the little guys breaking something, as there was a lot of glass and breakable decorations. I put most of them away, so I wouldn't need to worry so much. We were close to the elevator too, so that was a plus. It was easy to find and colse to several good eating places. We had one small problem and it was taken care of in short order. I vote YES for Violet's lovely condo! Good afternoon Beth....that you for taking the time to write the review of your vacation with us. I appreciate all your kind words and after all the e-mails between us, I feel like we have been friends forever! We will be keeping in touch. 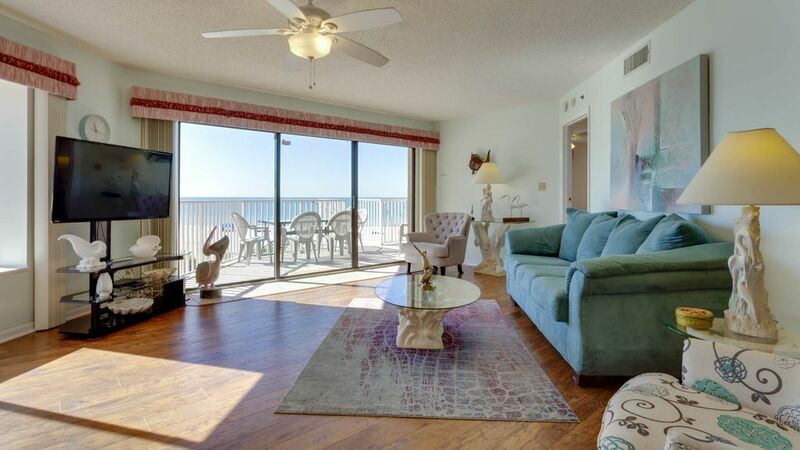 An excellent condo for a stay on the beach. We have been visiting this beautiful condo twice a year for the past 10 years and we love it! It is like a second home to us and we never want to return to the UK after our stay there. It is very spacious, spotlessly clean and there is everything you need for your stay. The views of the Gulf are fantastic and we spend most of our time on the balcony basking in the sun and chilling out. I would not hesitate to recommend this condo to anyone and it is also very close to the Friendly Tavern where you can buy a delicious meal and have a few drinks! Thank you so much, Alison. You are very kind with those words of praise and I appreciate your loyalty to our unit. After all these years, you and George have become dear friends and I do hope there are many more years for you both to come across the “pond” and enjoy the beach. we could have possibly needed. The spiral staircase to the beach and pool was an added bonus. The sound of the ocean and the sunsets absolutely priceless. Three generations of my family enjoyed a wonderful week at this comfortable condo. Vie was great and always available for questions. I highly recommend this property and hope to return. When I accept your reservation, I will send you a rental agreement by e-mail and expect it to be signed and returned by e-mail or USPS. All instructions and information regarding keys, parking permit etc., is in the agreement. Of course, I am available to you by phone or e-mail if you have any questions. You may contact me at 847-823-7043 or at bigvie@me.com. Any cancellation made by you 90 days or more before arrival will incur no charge. Any cancellation made by you between 89 and 31 days prior to arrival will incur a $100.00 per week charge. Any cancellation made by you within 30 days of your arrival is not refundable.